Helping babies and children enjoy a healthy start to life is one of my passions. Educating the public about the benefits of CranioSacral Therapy and Manual Therapy for early prevention and recovery will help support our future health resilience. Natural birth, while marvelous, is often stressful for newborn and Mom, and CranioSacral Therapy aids them to recuperate more quickly and thoroughly. Birth intervention, while sometimes critical for survival and other times helpful to ease the challenge of birth, can be traumatic for baby. With Caesarean section, in particular, the tissues surrounding the brain and spinal cord shorten in reaction to the sudden pressure change between the womb and outside. CranioSacral Therapy assists in releasing these restrictions, so infants may access their resiliency. Without such early intervention, they may be fussy and have difficulty sleeping or breastfeeding, or be susceptible to common health problems such as colic and digestive issues, eye or ear infections, or low immunity. Or, related health issues may present later. Toddlers often fall or have minor accidents, sometimes causing restrictions within their craniosacral system and contributing to health conditions. Children are affected by transitions such as new school, home move, family death, and parental separation, which may challenge their health and be treated by this holistic approach. I take great satisfaction in helping kids access their ability to self-correct, commonly preventing the use of antibiotics or procedures such as ear tubes for chronic infections. I love assisting children in weaning from thumb or finger sucking with intra-oral CranioSacral Therapy, as usually these kids are subconsciously trying to move their deeper cranial bones with sucking. CranioSacral Therapy is beneficial as an alternative or complement to orthodontia, depending upon dental severity. Amused by the roll away ball! Grounding on the therapy ball! 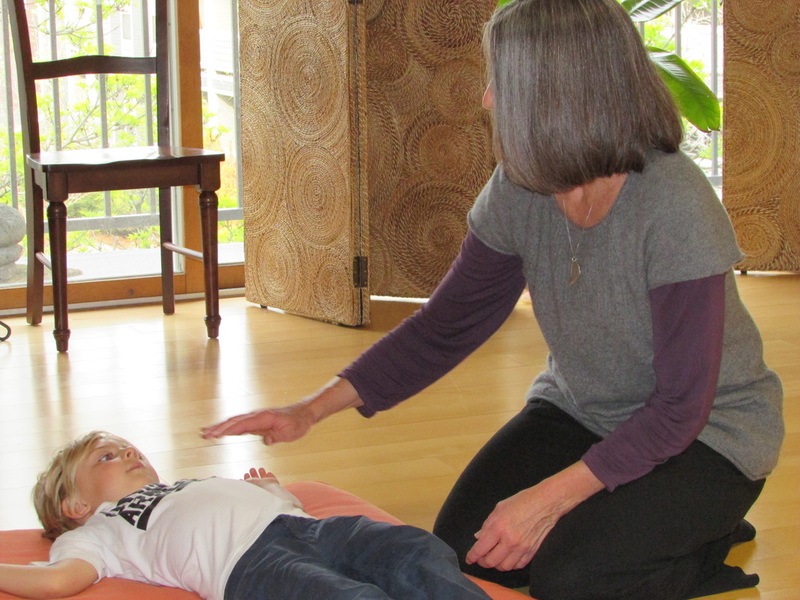 Behavioral issues, learning challenges, hyperactivity and attention issues with children can be assessed and treated with CranioSacral Therapy, by itself or as a complement with other approaches. CranioSacral Therapy helps kids release anxiety from their nervous systems and become calmer. Biting, hitting, and kicking are common behavioral responses to trauma, often physical expressions of frustration, and usually resolve easily with CranioSacral Therapy. Emotional outbursts of post traumatic anger or grief lesson with sessions. Depression and sleep issues, common in teenagers, tend to slip away with sessions, when the teen voluntarily agrees to come in. Sports injuries, including concussions, respond thoroughly to Integrative Physical Therapy, allowing children and teens to be less susceptible to further injury. Grounding exercise with puppy's help! I am a natural with children and teenagers, easing them into comfort in my warm office studio. I invite parents to assist your young child in bringing in a favorite blanket, stuffed animal, and/or book, to help him or her feel secure during sessions. They may also choose from stuffed animals or books in the studio to use during therapy. Mom and/or Dad stay for sessions, to help or be nearby. Once the child is comfortable with me, we spend most of the session with gentle hands-on assessment and treatment, and some of it with play activities, for integration and home program. Kids enjoy therapy and notice they feel better, so they look forward to returning, as needed. 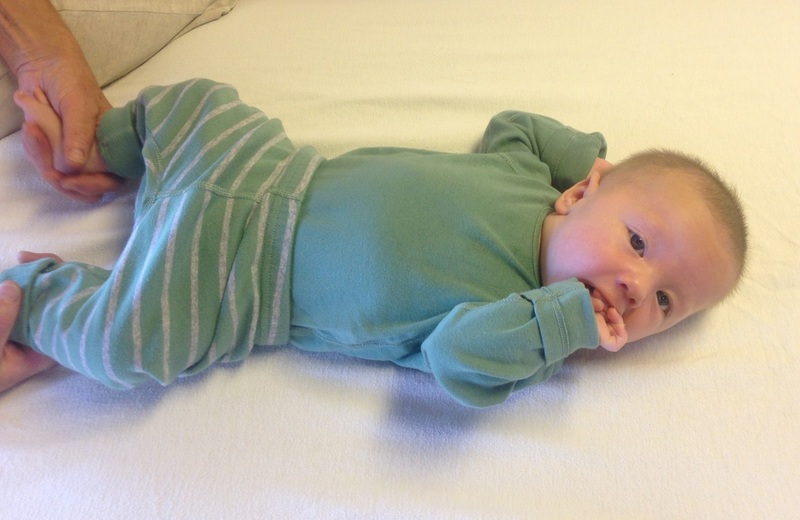 "Our son, from birth until 2½ years old, had a clogged tear duct. We tried numerous natural alternatives without success. Within 2 sessions of CranioSacral Therapy with Germaine, his eye completely cleared! Germaine has a remarkable way with children of all ages and personalities. Her profound expertise in CranioSacral Therapy is transformative for many ailments." U.H.